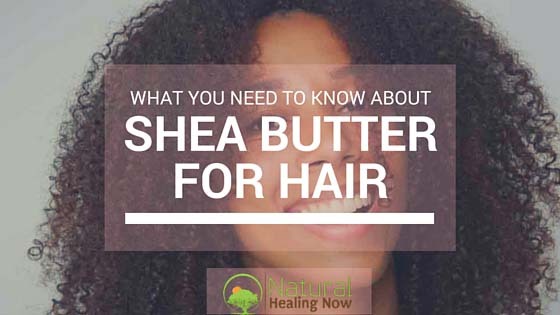 Is Shea Butter Good for Hair and what are the benefits of Shea Butter for Hair? Shea butter exerts a number of extremely beneficial effects upon the hair and scalp. First, one of the most crucial steps to healthy and lustrous hair is to have a healthy scalp. Nothing is more unattractive than hair that is dull and damaged, or hair that displays the consequences of scalp afflictions including flaking skin or dandruff. If one’s scalp exhibits signs of dryness, dandruff, or other more serious conditions, or if one has a much graver affliction such as bald patches, then using African shea butter for hair is a wise decision. Raw Shea butter has demonstrated healing qualities that can ameliorate a number of scalp conditions that cause hair to have a damaged and unhealthy appearance. It is extremely wise to keep an adequate supply of shea butter at hand at all times. Use this scientifically-validated product regularly, as a principal way to keep both the hair and the scalp healthy, resilient, and attractive. Shea butter’s unique properties mean that, when shea butter is applied to the scalp and then rubbed in, it can penetrate the scalp’s damaged skin and set in motion an effective rehabilitative process. When used regularly in this manner for several days, or even continuously, raw shea butter for hair will reduce and eliminate dry, itching, and flaking skin on the scalp. Application of shea butter to the scalp allows the scalp and the hair follicles to repair and rejuvenate, and return to a normal, healthy condition. Dryness, itching, and dandruff will be eliminated and the hair will immediately begin to appear more attractive. This is because shea butter has the capacity to penetrate deeply into all of the layers of skin that comprise the scalp. This capability permits the anti-inflammatory, anti-oxidative, and humectant characteristics of shea butter to moisturize scalp cells, trigger healing cell regeneration and renewal, and eliminate the inflammation that gives rise to itching. When the scalp skin is once again healthy, and any dryness, itching, and flaking have disappeared, the hair itself can begin a process of regrowth. The hair follicles in the scalp crucially influence and control the regeneration and the condition of one’s hair. Healthy, high quality hair follicles depend upon healthy skin, because hair follicles are very similar to skin pores. When hair follicles are restored to a healthy state, they can function normally and promote growth of healthy, moisturized, and lustrous hair. Thus the regular use of pure shea butter for hair can remedy such severe conditions as patches of hair loss on the head; it can even serve as a remedy for baldness itself. Pure African Shea butter also works extremely effectively when applied directly to the hair itself. The unique chemical properties of this natural fatty product ensure that each strand of hair is nourished, moisturized, protected, and given new shine and brilliance. When applied to the hair, shea butter has the ability to deeply penetrate the hair shaft and work from the inside to strengthen it and repair and renew the hair’s protein structure. This reparative process guarantees that such afflictions as split ends, susceptibility do breakage, and dryness are effectively and permanently ameliorated. In addition, when applied to the hair, shea butter forms an outer protective layer around each strand of hair. This ensures that the hair is properly moisturized. Even more importantly, this topical application of African shea butter to the hair guarantees that each strand of hair is protected from damage caused by exposure to the sun’s ultraviolet radiation, or by use of overly harsh shampoos, hair colors, or from contaminated atmospheric air. Due to shea butter’s important anti-oxidant properties, its use on the hair also ensures that damaging environmental toxins will not be able to oxidize the hair or generate harmful free radicals. In short, using African shea butter on the hair and scalp guarantees that one’s hair and scalp will be free from debilitating and damaging pathologies, and will exhibit clearly recognizable good health and attractiveness.